Quite a bit has happened in the last 6 days since I posted here. Tuesday afternoon was nice, so I went down to the police station and had them do an inspection on my bike. It passed every check on the list even though the horn was a little weak. It was nice to get that done with. I went for a ride that evening out to McLain state park and back, putting the first 20 highway miles on it! It was fun if not a little scary, listening to every little clink and rattle the bike made doing 60 down the road. I kept waiting for the timing chain to skip a link or for something to lock up and send me flying over the handlebars. Thankfully the bike ran just fine. I’m accustomed to cruising through the backwoods snowmobile trails at 60+ MPH — on a snowmobile you get the illusion of the snow being soft and fluffy and ready to provide a soft landing should you get thrown from the sled for some reason. Staring down at the asphalt road surface moving underneath you in a blur is completely different. Probably just something I need to get used to. Anyway, yesterday I went down to the secretary of state and after a little hesitation, got them to file the paperwork so I can finally get a title for my 1974 dream machine. To my great surprise, they told me I’d be able to get it registered and plated as soon as I presented proof of insurance! Last night I got it insured through Progressive.com ($202 for 12 months!) and went back to the SOS to get the plate and registration. I was fully prepared for it to be a long, drawn out battle to get my paperwork on the thing, but it only took 3 days! I also took the written motorcycle skills test today. 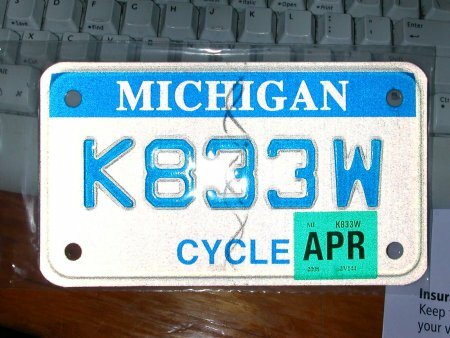 Generic stuff about lane positions, defensive driving and state motorcycle laws. I passed it pretty easily this time and now have my Temporary Instruction Permit (TIP). The final step in me cruising around on it this summer is for me to get the actual motorcycle endorsement. I need to take my TIP down to a certified motorcycle road testing place (there’s one just down the street) and pass the actual road test. I am generally excited about the whole thing. This entry was posted on Thursday, May 24th, 2007 at 6:01 pm	and is filed under Motorcycle. You can follow any responses to this entry through the RSS 2.0 feed. You can leave a response, or trackback from your own site.